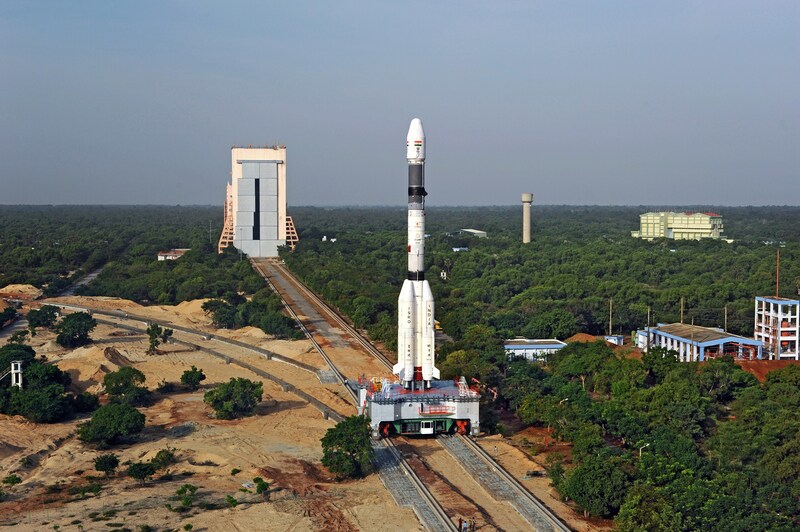 Liftoff from the Second Launch Pad of the Satish Dhawan Space Center on India’s East Coast is set for 10:40 UTC (16:10 local) and the three-stage rocket will need 17 minutes to deliver the 2,200-Kilogram satellite to a highly elliptical Geostationary Transfer Orbit. Thursday’s mission is designated F05 and marks the ninth launch of the GSLV Mk.II launch vehicle configuration and its Mk. I predecessor that premiered back in 2001 but had a very rough start. The Mk.I configuration, featuring a Russian-built upper stage, achieved a partial success on its first mission and the next two flights were successful, raising hopes that GSLV could take over launches of India’s large Geostationary Satellites that had to be outsourced to foreign launchers such as Ariane 5. 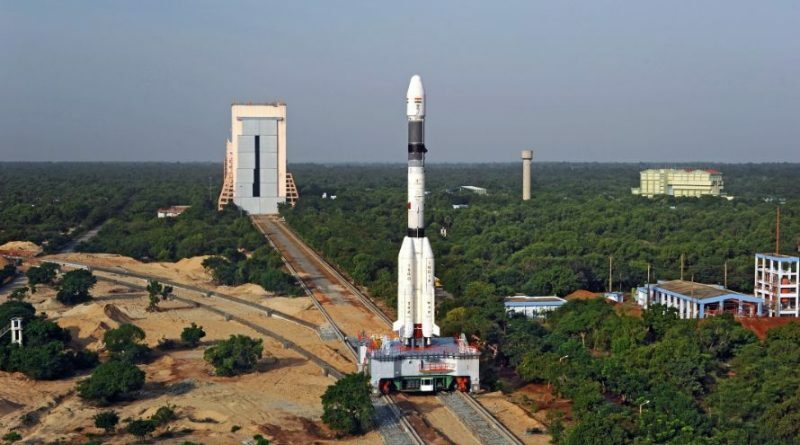 However, a string of failures of modified Mk.Is and the new Mk.II variant between 2006 and 2010 thwarted any prospects of transitioning GSLV to operational status any time soon. With only two successful missions in its first seven flights, GSLV was taken back to the drawing board for a complete re-design focusing of areas that showed obvious deficiencies in the inaugural missions. 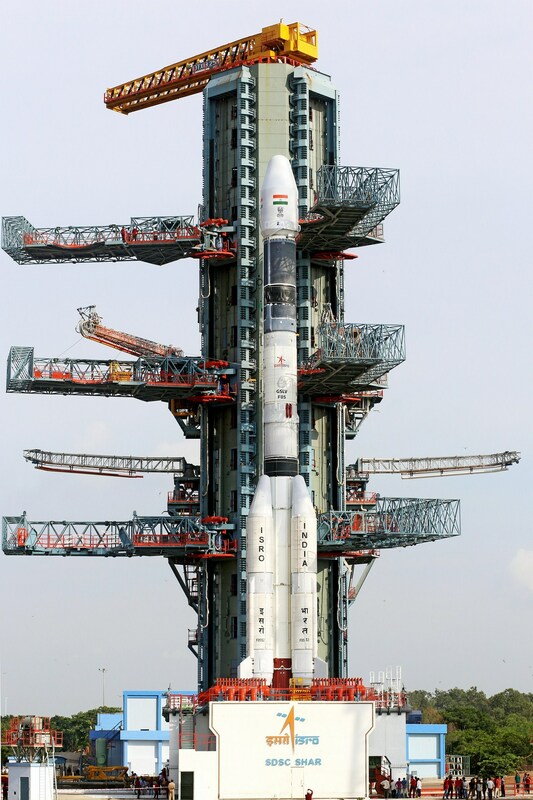 The top-to-bottom review of the GSLV design led to changes made on the new Indian Cryogenic Engine, the structural system of the launcher and the interfaces between the stages and the payload fairing. These changes were verified in an extensive ground testing campaign and GSLV returned to the launch pad in January 2014, successfully delivering the GSAT-14 communications satellite to orbit. Another demo mission in August 2015 lifted the GSAT-6 satellite, demonstrating the launcher could reliably perform to its design specification. 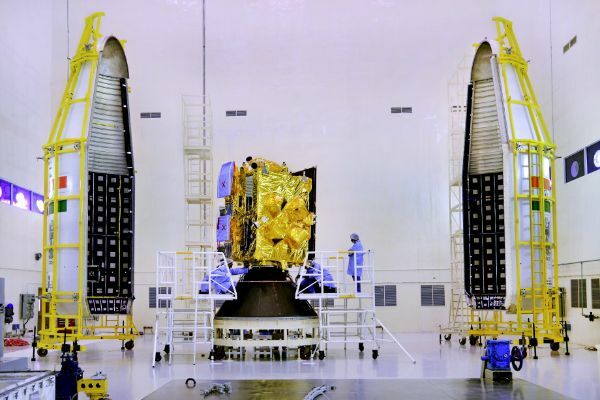 A more powerful GSLV version known as Mk.III or LVM3 made its debut in December 2014 and has about twice the payload capability of the Mk.II for the launch of even heavier Geostationary Satellites. However, LVM3 is still far from gaining operational status since its first flight only involved a simulator of the rocket’s powerful cryogenic upper stage. LVM3 is set to fly with the C25 stage for the first time later this year and another demonstration mission is to follow in 2017. 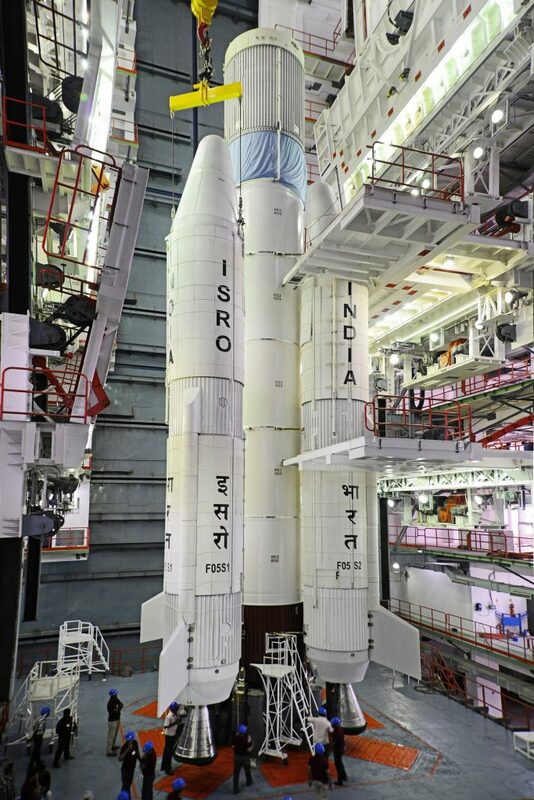 Engineers hope that GSLV Mk.II can demonstrate its reliability over the next three missions to be cleared to lift India’s high-profile Chandrayaan-2 mission to explore the Moon. GSLV Mk.II is comprised of a large Solid Rocket Motor inherited from India’s workhorse launcher PSLV. Acting as first stage, the 20.2-meter long, 2.8m diameter S139 solid rocket motor consumes 138 metric tons of highly energetic solid propellant in just 106 seconds of powered flight, generating a whopping thrust of 4,860 Kilonewtons. One of the peculiarities of GSLV Mk.II is that its four liquid-fueled boosters clustered around the core stage fire longer than the core – meaning GSLV has to carry the dead weight of the empty S139 until the boosters burn out and the entire assembly of core stage & boosters is separated as a whole. Each of the L40 boosters is 19.7 meters tall and 2.1 meters in diameter loaded with 42.6 metric tons of hypergolic propellants fed to a 763kN Vikas engine over the course of a two-and-a-half-minute burn. Sitting atop is the second stage that is also fueled by hypergolics and hosts a 799kN Vikas 4 engine. It measures 11.6 meters in length and holds 39,400 Kilograms of propellants. The third stage of GSLV is C15, India’s first indigenous cryogenic rocket stage powered by Liquid Hydrogen and Liquid Oxygen. Sometimes referred to as CUS, the stage stands 8.7 meters tall and facilitates 12,800 Kilograms of cryogenics burned by a single CE-7.5 engine operated between 73.5 and 93.1 Kilonewtons of thrust. 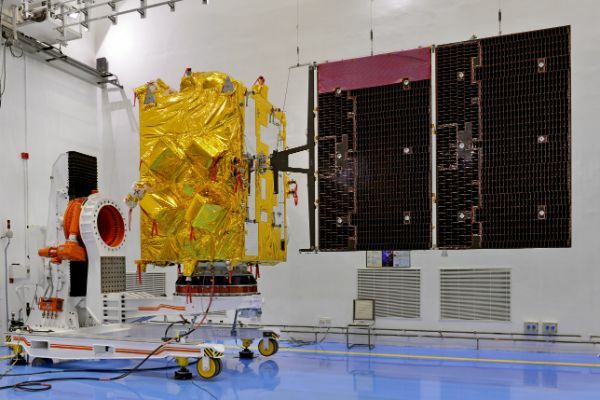 Hidden under GSLV’s 3.4-meter payload fairing is the INSAT-3DR satellite – almost an exact copy of the INSAT-3D satellite launched by an Ariane 5 in 2013. Its purpose is to enhance India’s weather forecasting capabilities and ensure a continuation of service beyond INSAT-3D’s operational life. The 2,211-Kilogram satellite is outfitted with a pair of instruments – an imager that captures full-disk frames of India and the Indian Ocean at one- to four-Kilometer resolution every half hour in six spectral bands to help in weather now- and forecasting as well as monitoring of land and sea surface. The INSAT-3D sounder covers 19 spectral channels in the visible and infrared wavelengths to generate vertical profiles of atmospheric temperature, pressure and humidity with a spatial resolution of ten Kilometers, also revealing concentrations of different atmospheric constituents including greenhouse gases. 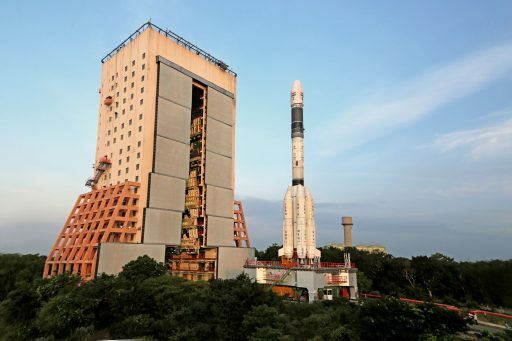 The 49-meter GSLV rocket was moved to the launch pad last week and ISRO’s Mission Readiness Review cleared the vehicle to head into a 29-hour countdown at 11:10 local time on Wednesday. The lengthy countdown is necessary to complete pre-launch checks and fill the boosters and second stage with UH25 Hydrazine fuel and Nitrogen Tetroxide oxidizer. Hypergolic propellant loading is to be completed on Wednesday and will be followed by tanking on the Cryogenic Upper Stage which needs to be kept replenished at flight level due to natural boil-off. Heading east across the Indian Ocean, GSLV’s core stage will burn out after a minute and 46 seconds followed by the burnout of the boosters at T+2:29 when the rocket will already be 71 Kilometers in altitude, traveling 2.4 Kilometers per second. When the boosters have shut down, the two stages are separated by flexible linear shaped charges allowing the spent first stage and boosters to be pushed away by the second stage which ignites split seconds before staging occurs. At T+3:48, the protective payload fairing will be jettisoned at an altitude of 115 Kilometers – when the vehicle is out of the dense atmosphere. Second stage shutdown comes at T+4:49 followed by stage separation 3.5 seconds later and Cryogenic Upper Stage ignition one second after that. India’s cryogenic stage begins its burn in high-thrust mode providing 9,500kgf of thrust. Following the initial portion of the burn, thrust is reduced to 7,500kgf for the remainder of the third stage’s 11-minute and 58-second firing, tasked with accelerating the stack from 4.9 to 9.8 Kilometers per second to accomplish the GTO injection. Shutdown is expected at T+16:52. The F05 mission is targeting an orbit of 170 by 35,975 Kilometers at an inclination of 20.61 degrees; INSAT-3DR will be separated just 13 seconds after the shutdown of the upper stage when the stack will be 230km in altitude.